I was talking with a potential client, and they requested that we plot some points with GPS, with a maximum (or should that be minimum?) accuracy of 2 m.
This is an area with no WAAS, and I was under the impression that even in the best of conditions, a single gps point can be accurate up-to only 15 meters(Horizontal field). Is this correct? What is the maximum theoretical accuracy of GPS without using WAAS or differential GPS? The United States government currently claims 4 meter RMS (7.8 meter 95% Confidence Interval) horizontal accuracy for civilian (SPS) GPS. Vertical accuracy is worse. Mind you, that's the minimum. Some devices/locations reliably (95% of the time or better) can get 3 meter accuracy. For a technical document on that specification you can go here. For more general GPS accuracy information, head to GPS.gov's website. That website also includes data and information on WAAS-enabled systems and accuracy levels depending on location. It's a great resource. Basically, you can't get 2 meter accuracy reliably without some form of correction. Edit: Something else to contemplate is using a device that can communicate with both GPS and GLONASS satellites. I'm not aware of any accuracy articles or studies that combine both systems to improve accuracy, but at the very least, it increases the potential satellites that may be available at one particular location/time, especially near the poles. Ionospheric delay effects are the largest source of error in a single-frequency GPS receiver. WAAS and CORS are able to correct for this better than a receiver's almanac, so the best you can do with uncorrected GPS is typically about 15 meters. 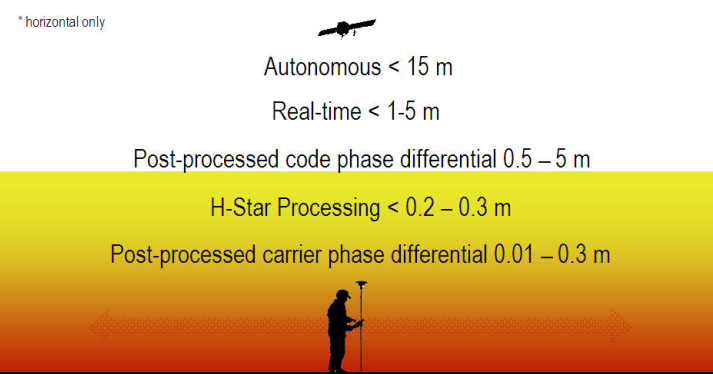 Survey-grade GPS using RTK is able to achieve centimeter accuracy. in European countries, out in the field (not inside a city with buildings), the best accuracy without any aid is 5 meters. I have also witnessed a 2 meter accuracy but that is extremely rare and I would not take it into account. The average best would be 15 meters and the average worse close to 30-40 meters. The results stated above are from my own field work and come from using various types of smartphones. GPS accuracy greatly varies depending on surroundings, devices used, weather and many other factors. The accuracy results are derived from compairing my actual position with the GPS position. These are results of tests carried out in October and December 2014. Tested were the following GPS telemetry, GPS data loggers and a hand held GPS. The benchmarks were 2 state survey marks (SSM) 35 km apart in Sydney, Australia. The data sheets for these marks were provided by NSW Spatial Exchange. Devices were left on the marks for 15 minutes at mark 1 and 30 minutes at mark 2. All devices are DGPS capable. Looking at the data from these readings, all these GPS unit's positional data "drift" around the static mark but on average give very acceptable accuracy for my purpose IMO. I would think that these devices would need to be left for 1 hour to stabilise properly. I use these GPS devices on World kite altitude record flights and in the remote zone I use and at altitudes up to 16,000 ft, there are 12 or even 13 satellites acquired. That's way more than most people seem to get in urban or forested areas. Any of these units will give me better than 0.08% accuracy over my height profile. If you want better accuracy then you need something like a Trimble Total Station or a similar survey grade GPS with additional augmentation. It depends on how much you pay and your understanding of the usage and limitations. People sometimes have unrealistic expectations of what is wonderful technology at a dirt cheap price. I originally paid $600 for the GPSFlight telemetry 9 years ago. The BRB was $300, TLA around $250, Garmin etrex $99, Holux $100, Tripmate $50. I can remember handheld readily available GPS units were close to $800 about 20 years ago. They are getting cheaper and cheaper but I cannot vouch for the quality or accuracy of all cheap units. Manufacturers of consumer grade GPS units usually make claims of sub 3 meter for position and sub 5 meters for altitude under good conditions. It seems it's still tremendous bang for buck seeing these devices can place you within a 10 meter square on the surface of the earth with 40 billion square metres. Realistically with a modern survey grade GPS receiver you can easily get down to a few centimeters via RTK within seconds or down to a few millimeters with static post processing and a several hours of post processed data. Not the answer you're looking for? Browse other questions tagged gps accuracy or ask your own question. Are there any technical limitations as to why GPS can't have a centimetre resolution?